To change the world for the better, more of us need to understand the world more deeply. To do this we need to all think holistically and improve our action while still using our specialist skills. To help us think holistically, a new book Changing the World provides a partly new theory of human life based on the Humanity System concept alongside a critique of the contemporary specialized social sciences. It integrates the best ideas from the social sciences, some from the ecological and technological sciences and some new ideas into the Humanity System . To take it further, we then need to use our free will and creative capacity for enhanced action. This book seeks to change our lives by raising our self-awareness and understanding of others and things around us. The insights will help you to contribute to a better future for yourself, your family, the community, city, nation and the world. A new holistic theory of human life based on the humanity system while pointing out the weaknesses in the specialized social sciences . If you are in Australia click this green Paypal button to buy Changing the World for AU$ 32 - including GST and delivery to your address by ordinary post. If you are outside Australia click this blue Paypal button to buy Changing the World for AU$ 42 - including delivery to your address by airmail, but not GST. Singly and together, theories of society, human ecology, economy, polity and other specialist concepts have failed to provide us with adequate whole solutions to major problems and issues such as terrorism, urbanization and carbon pollution. We need new concepts, new interpretations, new explanations and new action paths. Social scientists have not only been divided among themselves, but have been too isolated from the environment or human ecology and technology and its consequences in the long and short term. Modernity offers us the choice of private fossil-fuel transport that will eventually lead to the death of many if not most of our descendants; or electric trains and buses, even if fuelled by fossil fuel, that will give them a better chance to live a half decent life. But the conversation must be global, involving government-states, corporations and citizen organizations. It must also involve reducing emissions of methane and other warming substances. Sociologists underrate money, mind and nature; few economists consider personality and power, or properly value ecosystems; human ecologists likewise underrate mind and power. Each social science and related discipline has a relatively narrow focus that prevents it from fully contributing to a holistic understanding of the world. The book offered here attempts to help raise our understanding of our conditions, indeed our predicaments, to help mitigate our problems and resolve our issues. It does this by offering an integrating theory of both the global humanity system and local or national humanity systems that combines theory towards understaning with enhanced action. In the complex global humanity system that has evolved, ideas on personality, values, gender, ethnicity, learning and the environment vie with those on money, hierarchy, stratification, and technology in time and space, to help explain our condition and possible ways forward. Ideas are offered through the book to help guide useful actions. The theory of the humanity system begins with the mind, body, culture and the early evolution of humankind, including positive and negative emotion, and innate and community morality. It explores the further evolution of the early villages and onto the beginning of towns and cities where for the first time people experienced a major weakening of morality, and sometimes wealth and often poverty. The rise of modernity several thousand years later was based on a reassertion of the importance of logic, evidence and creativity, still accompanied by innate positive and negative emotion and innate morality. Modernity began with aspects of the early morality religions, some ideas and practices of the Classical Athenians, and other contributions, coalescing in northern Italy in the 1400s. It expanded with early colonialism, and initially boomed during the industrial revolution and the associated intensification of colonialism. For 500 years, negative and positive modernity have vied with each other around the world. Modernity has involved the private creation, use and misuse of money; organized science, industrialization, sub-global colonialism, population explosions, organizational gigantism, mega-cities and semi-democracies. Our contemporary problems include adverse personalities in powerful positions, private money creation, corporate bribery, political corruption, building rigidity, specialized schooling curricula, media oligopolies, government-state spying on the masses, and huge inequalities. However, our most serious probems are climate change, food shortages, pandemics and potential nuclear explosion, all basically human ecological or environmental ones, but driven by mind-bodies, ideas and material conditions. Villagers came together with government-state staff and outsiders to learn about and discuss alternative forms of development, including gender equality, birth control, contour farming and savings and loans groups. This learning support and dialogue led to the formation of groups and new activities with very little funding required beyond the salaries of the outsiders. 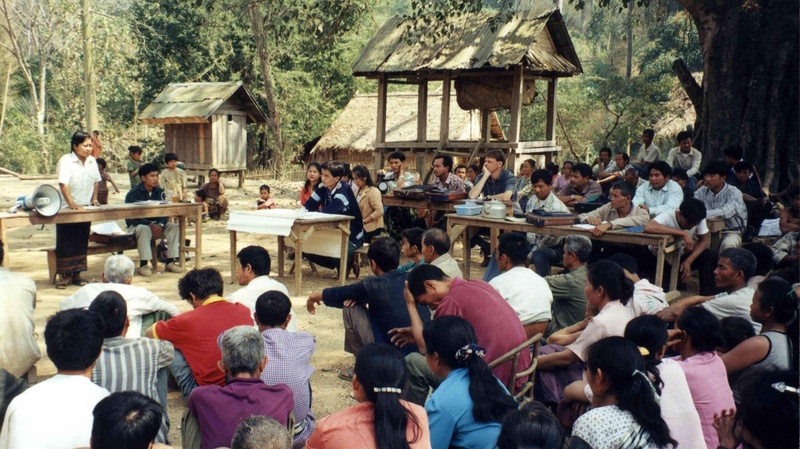 This idea had the potential to spread without outside input if greater attention was paid to government-state hierarchy (Northern Laos, 1998). This book shows that in order to change the world for the better, we need networks of leaders and cooperators at all levels with free will, creative intellectual capacity, positive values and a willingness to learn to foster minor and major positive change everywhere. We can all use and offer learning support, dialogue, group learning, networking, online with paper means and face-to-face, other action and where necessary, mass protest. The dialogue must be global at all levels. It is also important that enhanced learning and action are integrated. If you are in Australia, click this green Paypal button to buy Changing the World for AU$ 32 - including GST and delivery to your address by ordinary post. If you are outside Australia, click this blue Paypal button to buy Changing the World for AU$ 42 - including delivery to your address by airmail, but not GST.